I'm happy to announce that after our biggest, most comprehensive, usability study (with excellent feedback from over 400 users), CHI has released our most significant update of PCSWMM yet - PCSWMM 2009. With a streamlined, adaptive user-interface that improves work-flow for experienced users at the same time as dramatically reducing the learning-curve for new users, PCSWMM 2009 makes significant strides forward in end-user productivity. In addition, we've added cutting-edge 2-D floodplain analysis tools, automated radar rainfall acquisition/processing for improving the spatial resolution of raingage networks, and revolutionary real-time modeling / flood forecasting capabilities. I'll discuss these in more detail in a later post. PCSWMM 2009 replaces PCSWMM.NET and is a free upgrage for all current PCSWMM.NET users. I've tried to anticipate some of the questions you may have about this new version below - let me know if you need clarification on anything I miss. We've used the PCSWMM.NET name for our EPA SWMM5 spatial decision support systems since it's release in 2007. Originally the name came about from a need to differentiate the software from PCSWMM 2006 (our EPA SWMM4 interface) and to underline that the PCSWMM.NET software was completely rewritten from the ground up (using the state-of-the-art Microsoft .NET 3.5 framework). Now, three years later, we'd like to make sure the software takes its rightful place as our flagship software, and thus the return to just PCSWMM. As we subscribe to more of a software-as-a-service model, regular and significant additions in functionality are made on a continuous basis, however we have added a 2009 suffix to PCSWMM to differentiate it from the still available PCSWMM 2006 software. As indicated above, all PCSWMM.NET licensees with current update and support contracts qualify for downloading, installing and activating PCSWMM 2009. 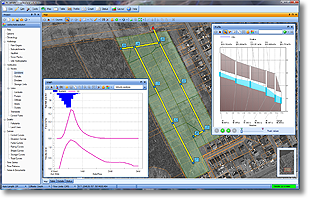 The new release fully supports EPA SWMM5.0.014. We are holding off supporting EPA SWMM5.0.015 until a bug is corrected in the EPA SWMM engine related to RDII. We've also greatly expanded the functionality of the Tables panel, added new measurements of error, improved the drawing of entity shapes, added units after attribute names in the Attributes panel, and much more. But I thought the interface was pretty good already. We've have had lots of very positive feedback on the PCSWMM.NET interface. But we are certainly not content to rest, and for the past 3 months we've taken a step back from our normal full-steam ahead approach of adding exciting new capabilities, and focused exclusively on improving the efficiency of the graphical user interface (GUI) from a user-productivity stand point. At the same time, we acknowledged that with a program of the scope of PCSWMM, the sheer number of features can be intimidating, so we also put a big emphasis on the intuitiveness of the interface for new users. As a result of the fantastic input we recieved, we've made hundreds of small tweaks (and some bigger ones). Of course, we have stayed with our flexible panel-based interface, but have moved all commands and tools related to a panel to the relevant panel - to minimize mouse movement. You will also notice that pop-up editors and message boxes appear right where your cursor is, again reducing mouse movement. We've also been fanatical about reducing the number of mouse clicks to the absolute minimum required to acomplish any task, and making sure that the program intelligently anticipates your next move wherever possible. For example, all of our Open and Save As dialogs (we have over 20 of them) remember their own last browsed folder - even between sessions, the Simulation Options dialog remembers the last tab you were under, and the Import Data Wizard's attribute matching tables remember all previous attribute matches and applies them where appropriate to new data sources. Simple things that, added up, can save tens of minutes over an 8 hour day, and can certainly save fatigue in your mouse hand. Relatedly, we've gone over the entire interface pixel by pixel to ensure there is absolutely no unnecessary clutter that would divert the eye, and that button icons are distinct and largely intuitive. We've also placed the buttons and controls where you would expect them, reduced the number of items that appear in pop-up menus, and reduced the number of menu sub levels. The result is a clean, crisp, efficient and easy-to-use interface. What about the big changes you mentioned? The two biggest changes in PCSWMM 2009 is the migration of the toolbars to the panels and the consolidation of some of the panels. As mentioned, we've positioned all the tools and menu commands related to a specific panel in the panel (as opposed to a centralized menu and toolbar). This does 4 things. First, it positions the items exactly where you need them - near your mouse cursor (especially if you are working with multiple monitors). Second, it makes it very clear what the command will be applied to (i.e. the map, table, graph, profile, or attribute panel). Third, it allows more space for additional toolbar buttons, providing quicker access to more common commands and reducing mouse clicks. Forth, it allows the target area of the commands (i.e. button size) to be larger. Increasing the target area allows your mouse hand to find and execute the command more quickly, again improving efficiency. the Overview panel with the Map panel. Again, the philosophy is to put the tools that work with each other together. Of these changes, probably the biggest one to get used to is the transition of the Layers manager from a separate panel to a drop-down editor in the Map panel. There are at least 3 big advantages in doing this. First, the Project panel is always visible, reducing the required mouse movement and clicks to access the SWMM5 editors. Second, the Layers manager is always within the Map (where it applies). Third, the Layers manager doesn't take screen space when not being interacted with. Merging the Preview panel with the Attributes panel also reduces the required screen space and simplifies toggling the preview mode on/off. The Clipboard panel (which shows the map entities that have been copied to the clipboard) is now part of the Paste toolbar button as an optional pop-up previewer. The Overview panel has been removed in favour of a overview map that floats in the Map panel itself. These last two changes again free up screen space for other purposes and keep the components with the Map where they apply. At any rate, we hope you agree with us on the improvements in efficiency and will let us know what else we can do in that department (or any other).